If 2017 will be your year for new adventures and relaxing vacations, then you better start researching about the best destinations and travel trends for next year. Travel + Leisure just released its list of the Best Places to Travel in 2017 and you might be surprised by some of the destinations that made into the list. From tropical hot spots to American cities that are worth “revisiting,” let’s look at 6 of the must-visit places in 2017. If you are a true lover of wine, then you need to visit the first, burgeoning wine region in Mexico, Valle de Guadalupe. The new talk of the town for wine connoisseurs is buzzing with stylish boutique hotels, restaurants with international acclaim and sprawling wineries with beautiful panoramic views, but still maintains its low-key feel where you can easily mingle with locals and the winemakers themselves. The wine region is just 80 miles south of San Diego, barely an hour from the border. This British island territory is now attracting travelers after it has recovered from a financial crisis. It’s known for its beautiful pink-sand beaches and treacherous reefs. 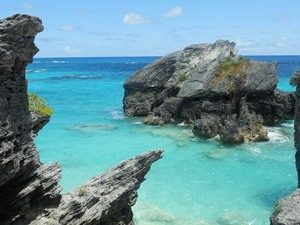 Lonely Planet describes Bermuda as an island adventure and a cultural destination. So if you want a Caribbean experience next year, add Bermuda on your list. Tamuda, an ancient city in Morocco, has now turned into a bona fide resort destination with the recent openings of a number of luxury hotels, beach resorts & spas like Sofitel and Ritz-Carlton. The stunning architectures and modern designs of these coastal luxury accommodations will surely make your stay a memorable and relaxing one. But aside from the sun and surf, this destination also offers a variety of entertainment and history such as museums and one of the country’s best preserved medinas. This city on the western coast of Honshu is now easily accessible, thanks to the new bullet-train extension from Tokyo. The 2.5 hour-train ride will bring you to one of the overlooked jewels of Japan. Here, you can see beautifully preserved samurai and geisha districts, attractive temples, museums and markets where you can enjoy eating sushi at a much cheaper price than Tokyo’s. It looks like it’s going to be a great year for Tennessee on 2017. The Country Music Hall of Fame & Museum will celebrate its 50th anniversary and the Bluebird Café will turn 35. The city is also brimming with new and upcoming eateries and hotels that vacationers will undoubtedly enjoy. Norfolk is currently booming, thanks to its flourishing arts scene and entrepreneurship. If you are a beer lover, Norfolk’s craft beer is a huge attraction. There are a lot of new breweries that opened this year and several more are expected this 2017. Aside from eateries and breweries, you’ll love the other entertainment additions such as the NEON District, Norfolk’s first official art district that screams urban cool.